Most of the nitrogen losses from bananas in both best management practice and conventional management is particulate nitrogen, associated with sediment movement. Lower rates of nitrogen loss occur in deep drainage when recommended fertiliser rates are used. Fortnightly application of nitrogen results in lower losses in deep drainage compared with monthly application of fertiliser (at the same total rate). 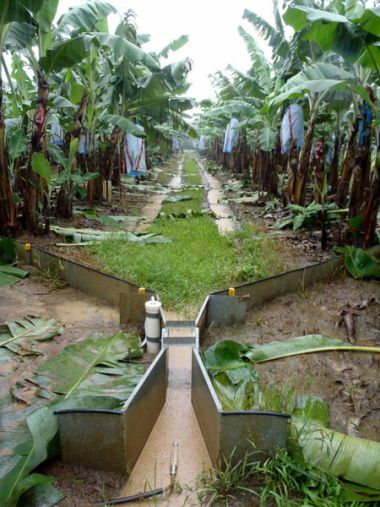 Bananas are an important crop in the Wet Tropics and are grown on 11,000 hectares. High rates of nitrogen loss in deep drainage have previously been measured from paddocks receiving high rates of fertiliser nitrogen. Since 1995, nitrogen application rates used by the industry have reduced by as much as 40 per cent (Sing 2012). Two monitoring sites at South Johnstone are comparing best management practice (site one) with conventional management (site two) of nitrogen fertiliser and sediment control. Site one – 250 kilograms of nitrogen per hectare per crop cycle applied in fortnightly doses by fertigation with mini-sprinklers and grassed inter-rows to control sediment movement. This is the optimum rate determined by earlier research (Armour et al. 2012). Site two – 236 kilograms of nitrogen per hectare per crop cycle applied in monthly doses as a broadcast application on the surface of the mound. This rate was lower than the target of 375 kilograms of nitrogen per hectare and partly due to the disruption of the farm schedule after Cyclone Yasi. Inter-rows were bare (grass and weeds controlled by herbicide). There was 5820 millimetres of rain for the period July 2010 to June 2011, compared to an annual average rainfall of 3300 millimetres. Monitoring of water quality in both surface and ground water was interrupted for two months post-Cyclone Yasi due to site access and infrastructure problems. Nitrogen loss from the paddock was measured in runoff (surface water) and in deep drainage below the root zone with lysimeters. The nitrogen load in runoff was as high as 60 kilograms of nitrogen per hectare using conventional management at site two. Most of this (90 per cent) was in the form of particulate nitrogen, rather than dissolved inorganic nitrogen, which is immediately bioavailable. The nitrogen load was much higher than that measured in a previous study (one to eight kilograms per hectare). In deep drainage, concentrations of nitrogen as nitrate-N were low at both sites (0.2 milligrams per litre for site one and 0.5 milligrams per litre for site two). Loads of nitrate-N moving below the root zone over the year were three kilograms per hectare for best management practice at site one and seven kilograms per hectare for conventional practice at site two. These deep drainage loads of nitrogen include estimated losses for the periods when monitoring was interrupted. This estimation was made from the average nitrate-N concentration for the year at each site and the average drainage as a proportion of rain. The deep drainage loads are only a small proportion (one to three per cent) of the fertiliser nitrogen applied. Losses were lower when fortnightly, rather than monthly, applications of nitrogen fertiliser were applied. 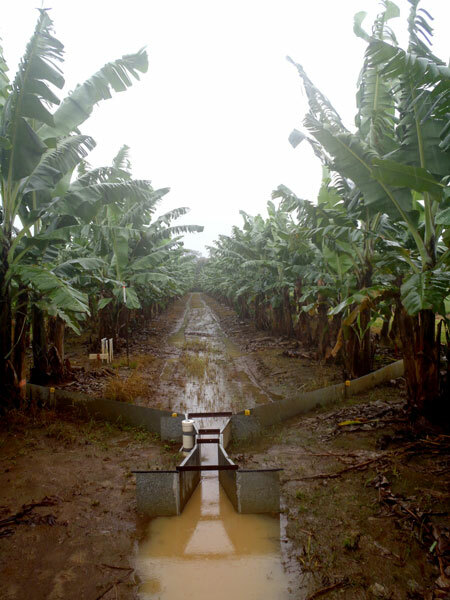 The nitrogen in deep drainage at these sites was much lower than those reported previously from bananas in north Queensland. At Tully and South Johnstone, loads as high as 38 to 105 kilograms of nitrogen per hectare per year have previously been reported when nitrogen fertiliser rates were 230 to 400 kilograms of nitrogen per hectare per year. Armour, J.D., Nelson, P.N., Daniells, J.W., Rasiah, V. and Inman-Bamber, N.G. (2012). Nitrogen leaching from the root zone of sugarcane and banana production in the humid tropics of Australia. Agriculture, Ecosystems and Environment. In press. Sing, N.C. (2012). Banana Voluntary Adoption Survey Results, Terrain NRM, March 2012. John Armour, Bronwyn Masters and Christina Mortimore (Queensland Government Department of Natural Resources and Mines).